At CrossFit Epping, we’re a community of regular people from all walks of life committed to one thing - being better versions of ourselves. You put in the hard work and effort, and we’ll put in the passionate coaching, top-tier facility, and abundance of motivation you need to get to your goals ... and then break through them. No matter where you’re starting today - whether you’re an elite athlete or a first-timer - our three workout levels (fitness, performance and sport) will make sure you’re challenged to your greatest ability. You can. You will. End of story. CrossFit Epping’s 8,750-square-foot box is Epping’s CrossFit headquarters. We’re over-equipped with all the top-tier CrossFit tools you know and love (and sometimes love to hate). Our experienced coaches specialize in motivating you to push past your breaking point and into the success beyond. And our encouraging members of every shape, age and fitness level make you feel right at home from the moment you walk in the door. Plus - we’ve got a second gym space that you can use anytime for open gym - even during classes! You’ll never have to battle for space or equipment again. After 1 hour at CrossFit Epping, I knew I would never worry about getting bored or staying motivated again. Not only do you get a surprise each day with your WOD, but the camaraderie amongst the coaches and members at the gym is priceless. Amazing gym. Tobey is a dedicated, attentive coach and his programming is well thought through. 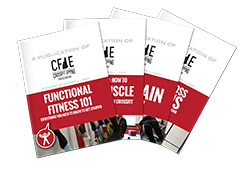 You get the whole package at CF Epping of mobility work, varied warm-ups, strength and your traditional CF MetCons. Thanks CrossFit Epping!!! Tobey and Sean rock! Amazingly skilled, knowledgeable and passionate coaching staff and an overall feeling of camaraderie and inclusiveness. No one is ever left behind.